ROAR 4 Tony & Friends!! We’re supporting our very good friends Animal Legal Defense Fund and their “I Am Not Property” Campaign. Visit aldf.org/iamnotproperty for more info and to join. Tony’s captor, Michael Sandlin, considered Tony his property. Tell Michael Sandlin: NO MORE TIGERS! TWEETSTORM! 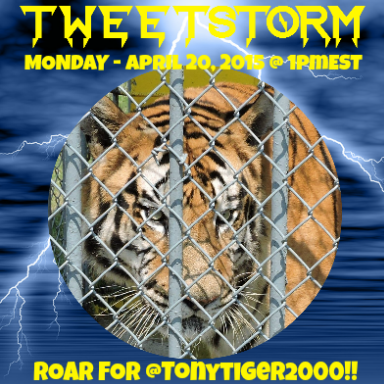 APRIL 20, 2015 ~ 1PM WE TRENDED #SHORTY4TONY! NOMINATIONS CLOSED! TONY IS A FINALIST! 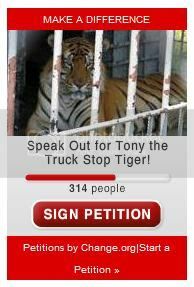 Support the Big Cat Public Safety Act! Sign The Animal Bill of Rights! Petition Closed 53,614 Signatures – Thank You. 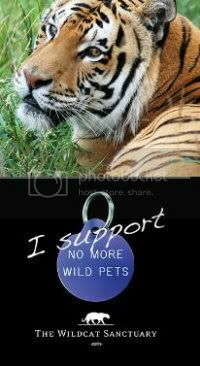 Take Wildcat Sanctuary’s No More Wild Pets Pledge! Petition Closed On November 3, 2011 With 39,286 Signatures. Thank You. Petition Closed On November 3, 2011 With 12,190 Signatures. Thank You. Petition Closed With 40,729 Signatures Thank You! 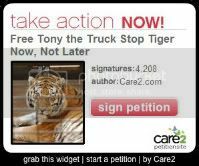 Join Our Fight To Free Tony!